Japan's Toshiba has confirmed it is paying $5.4bn (£3.1bn) to buy Westinghouse, the US power plant arm of British Nuclear Fuels (BNFL). Toshiba said it plans to sell stakes in Westinghouse to minority investors, though it will keep hold of a controlling stake of more than 51%. 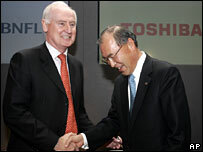 Toshiba said the deal would see it become a "global nuclear power business organisation" which was also reliable. Nuclear power is in the news at present as a possible alternative to oil. Mike Parker, chief executive of BNFL, said the agreement would allow Westinghouse to compete more effectively for new US work. The Japanese conglomerate had been selected as the preferred bidder, and the amount it paid was three times what state-owned BNFL had originally expected to raise. Toshiba beat bids from General Electric and Mitsubishi Heavy Industries.